Out and about in the seaside resorts of Loire-Atlantique. 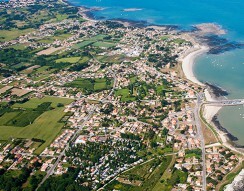 A camping holiday in Loire-Atlantique provides the ideal opportunity to explore the region and its wonderful coastline of sandy beaches, unspoilt coves and fascinating coastal towns. 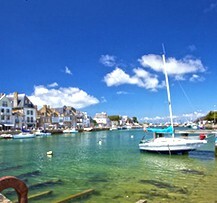 Set in a sheltered corner of the Atlantic shore between Brittany and Vendée, Loire-Atlantique promises a magnificent coastline and the chance of a stroll around its lovely seaside resorts and fishing ports. 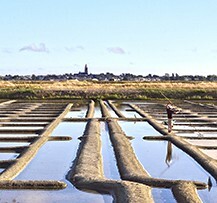 Starting from La Baule and taking in Batz-sur-Mer and Le Croisic, you can walk along the Guérande peninsula’s Côte Sauvage with its famous salt marshes. 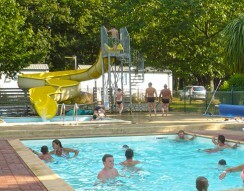 A camping holiday in Loire-Atlantique further south Saint-Michel makes the ideal base for surfing and sunbathing at resorts such as La-Plaine-sur-Mer and the unmissable Pornic. Finally, from your campsite in Loire-Atlantique you can also take a trip inland towards Nantes for a visit to one of the many history-charged heritage sights such as the Château de Blain, or enjoy a glass of Muscadet as you explore the vineyards that border the river Loire. 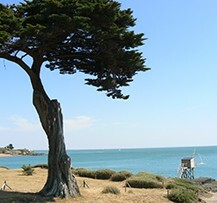 Pleasant wooded countryside, where you can swim in the pool or the Atlantic Ocean, explore the local ports or take a trip to the Île de Noirmoutier. The Loire-Atlantique coastline offers a succession of wild, rocky landscapes and seaside towns and more than a breath of invigorating sea air. You’ll soon be charmed by the fine sandy beaches at La Baule, Le Pornic and Le Croisic, where you can spend your day alternating sunbathing and shopping. On your next holiday at one of our campsites in Loire-Atlantique, don’t miss the chance to sample some of the great local food: fresh fish and seafood served with a liberal sprinkling of Guérande salt, washed down with a glass of Muscadet. A drive out into the local countryside offers the perfect occasion for searching out some of the best local produce. Our campsites in Loire-Atlantique make an ideal base for exploring the sunny rolling hills of the Muscadet region, planted with vines as far as the eye can see. A fruity wine, full of character, you’re sure to love it! 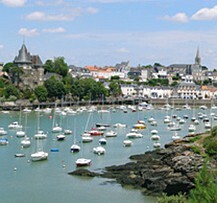 The pride of Loire-Atlantique, Muscadet is one of the oldest appellations d’origines contrôlées (AOC) in France with no less than four sub-appellations: Muscadet, Muscadet-Sèvre-et-Maine, Muscadet-Coteaux-de-la-Loire and Muscadet-Côtes-de-Grand-Lieu. From your campsite in Loire-Atlantique, take a bike ride and explore the Anjou vineyards or the lovely countryside around the city of Nantes. Or cycle down the Loire valley, stopping to explore the Muscadet vineyards and sample some of their famous wines. 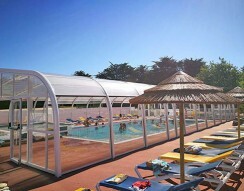 Book the rental accommodation of your choice at one of our campsites in Loire-Atlantique now and look forward to a fascinating yet relaxing holiday with your family, in a couple or with friends.